Please excuse those unsightly cords, I plan to remedy that soon enough. 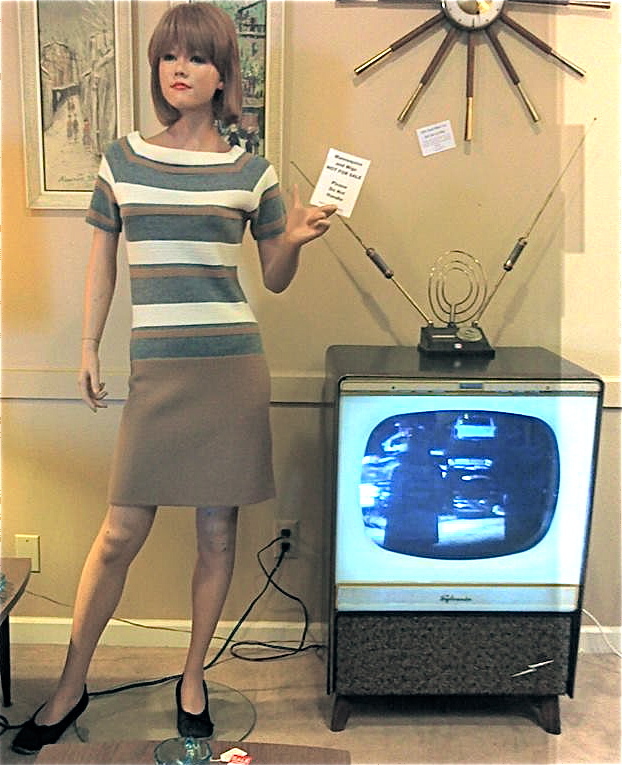 A while back I came across this television in Sacramento. I thought it might be a good conversion project for our friend Justin of Stellar Electronics. Justin said he liked the tv, so I offered to pick it up. But, once I picked it up I fell in love with it! It was so clean and even had the original floor stand. I asked Justin if he would be interested in a conversion trade for our 1960 GE conversion that he completed for us sometime back. Luckily, he agreed. 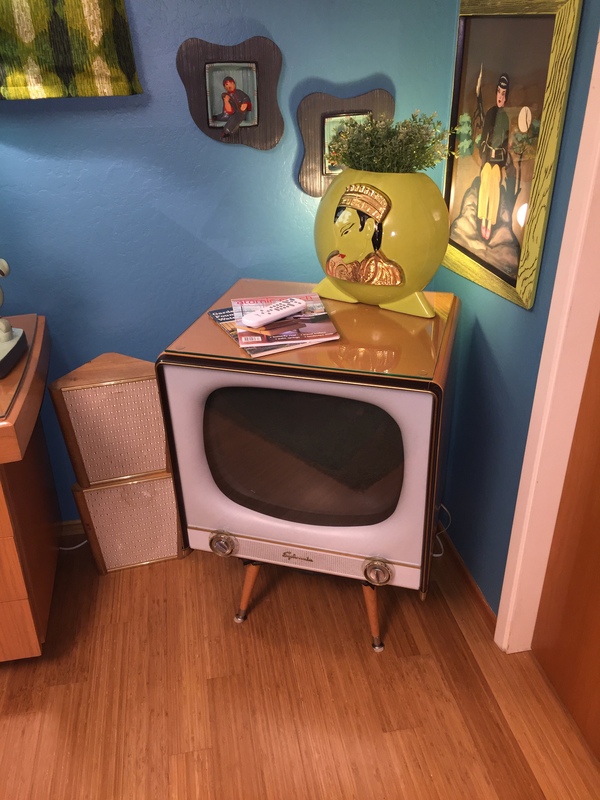 The General Electric conversion was dynamite, but this style TV works better with our decor. This television is now in our guest bedroom. I refinished the cabinet to match the Franklin Shockey bedroom set in the room. It all looks so fantastic together. These are nondescript corner speakers. I plan to replace the fabric on both of them with something atomic. I’ll also refinish them in the champagne Heywood Wakefield toner sold by Jeff at Needful_Useful_Things on eBay. 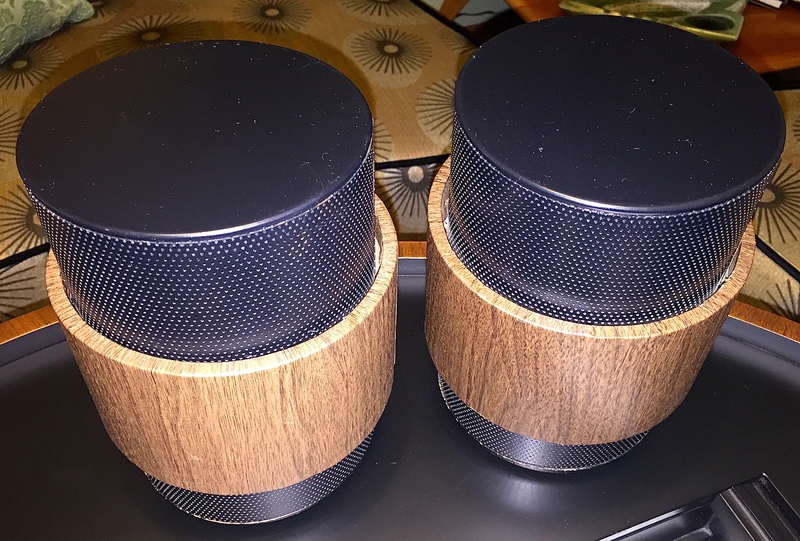 These are the corner mount wall speakers that Mel and I picked up to complement the Sylvania. I plan to rewire them and get them hung in time for the up and coming Sacramento Mid-Century Modern Home Tour. Justin also added more modern connectivity to the back of the set. Of course, this is what these televisions are known for, the ring of light on the front. I am so glad we have a Halo in our collection now. This is such a unique television. This television has a pleasing glow and has multiple setting for the brightness of the surround. 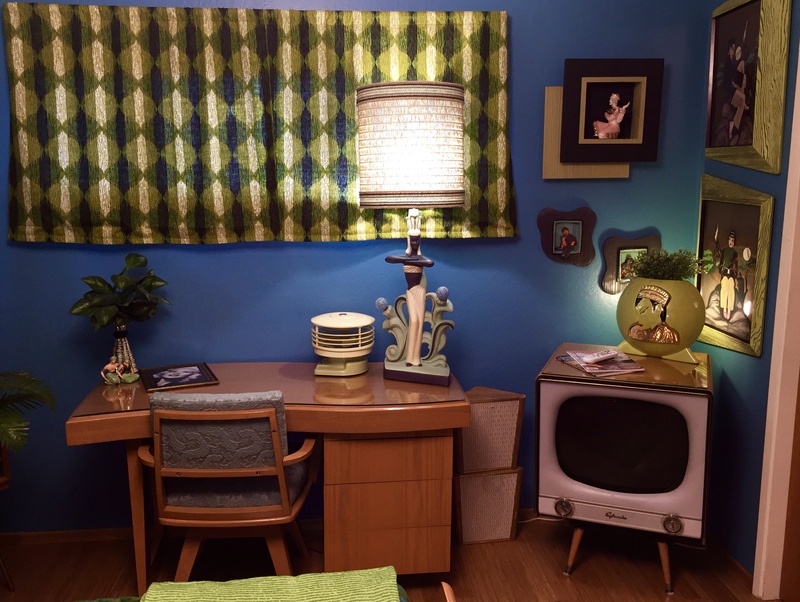 We had this fantastic asian television lamp that I knew would look great on this set. The whole idea of the Halo television was to make tv lamps obsolete, but I couldn’t help myself. I plan to just have a DVD player hooked up to it so guests can watch any of the classic movie flicks we have in our collection. This was the last piece of furniture to add to this room. I couldn’t be more pleased with the look of this room. 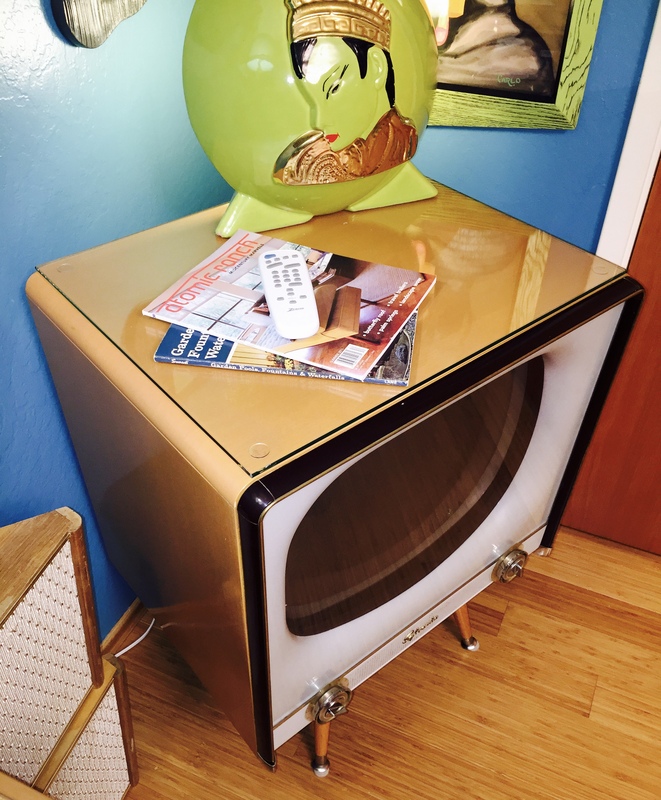 Posted in Restorations, The Makin's Of Our Pad and tagged 1950's television, 1950's tv, 50's television, 50's tv, atomic electronics, atomic television, atomic tv, fifties television, fifties tv, halo, halo television, halo tv, mid century electronics, mid century television, mid century tv, Midcentury electronics, midcentury television, midcentury tv, Philco Television, Philco TV, rare television, rare tv, retro electronics, retro television, retro tv, sylvania halo, sylvania television, vintage electronics, vintage television, vintage tv. Bookmark the permalink. 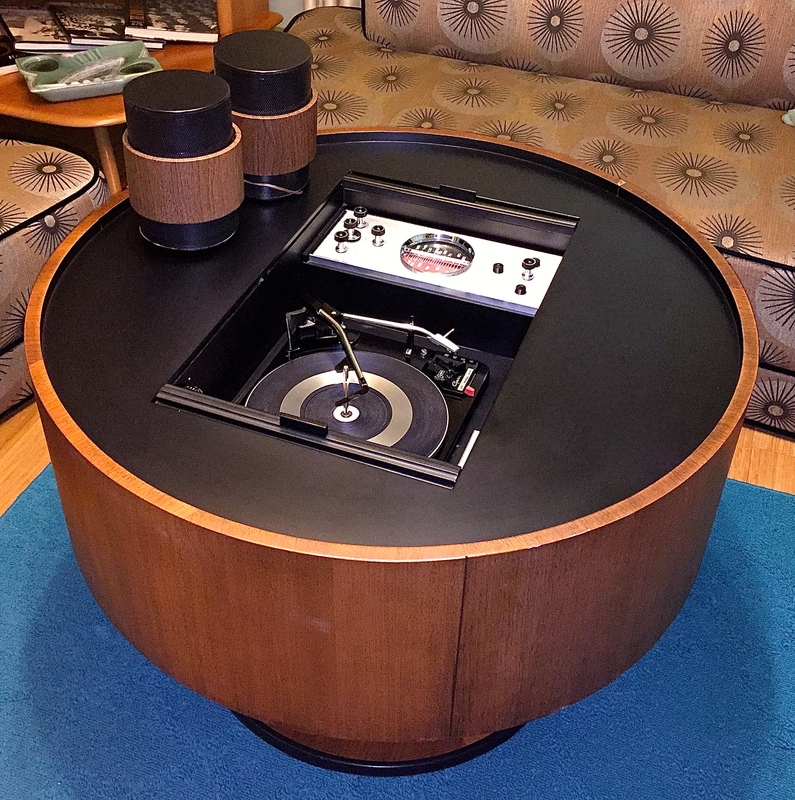 For a while now Mel and I wanted to set up an area in our living room to listen to records. I love my library of digital audio files, but there is something about listening to a record that allows you to feel the music. I love how every single record is an event….heck some records are an experience. I love the visuals of the album cover and the back story that’s written on the cover. We were out looking around at antique shops and came across this really nice The Voice of Music record player. I was drawn to it because of its hairpin legs and I am a sucker for blonde finishes. The cabinet is in great shape for its age. I will leave it as it is for now, but might restore it later. It even had the original plater disc! Looks like you can hook up an external radio…..maybe I can play my iPhone through it too? I am currently looking for a matching tension pole record stand so it looks more balanced. 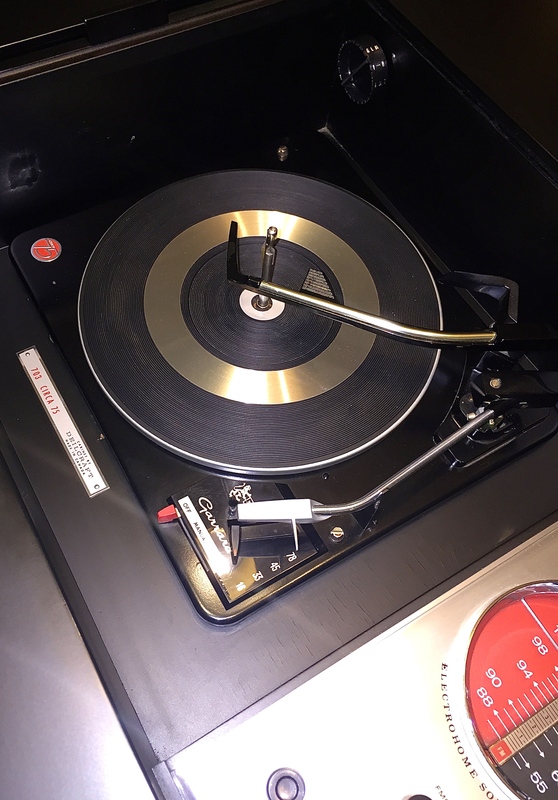 It came with its original operating instructions and…..
a record that is supposed to help you adjust the tone to maximize its audio quality. This will get a lot of use. It is so nice to listen to my favorites like Marty Robbins, Jim Reeves, Patsy Cline, Lena Horne, James Brown and so many others. Posted in The Makin's Of Our Pad and tagged 1950's record player, 1960's record player, 50's record player, 60's record player, atomic electronics, atomic record player, fifties record player, mcm electronics, MCM record player, mid century electronics, mid century record player, Midcentury electronics, midcentury record player, retro electronics, retro record player, sixties record player, vintage electronics, vintage record player, Voice of Music record player. Bookmark the permalink. This was a long anticipated arrival! Justin picked up this 1958 Olympic Hi-Fi (black and white) unit at a yard sale a while back and when I saw it in his shop I knew it had to be be mine. You might remember the GE conversion Justin did not too long ago. That unit worked out great, and I knew Justin would do the same with this unit. Justin went through the radio and record player to make sure they worked perfectly. 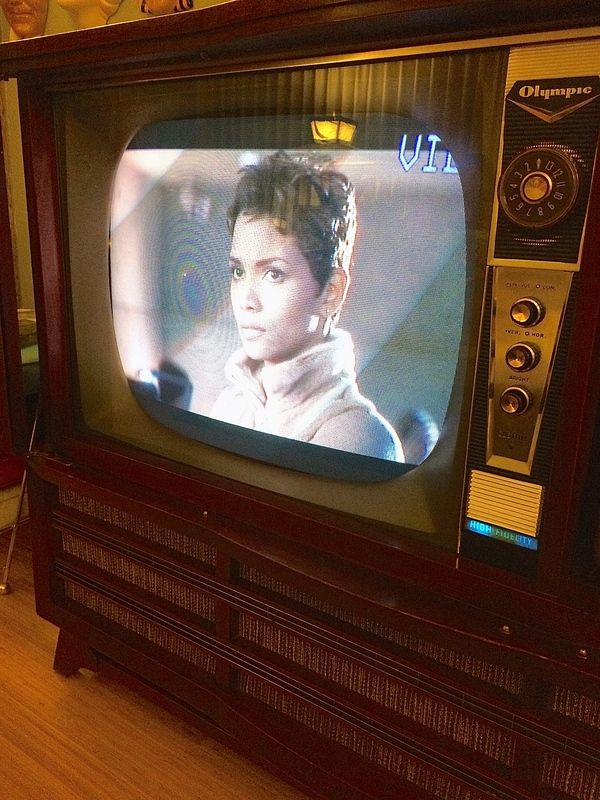 The color tube(CRT) Justin installed is from a 90’s RCA television. Justin did such a fantastic job on this one. 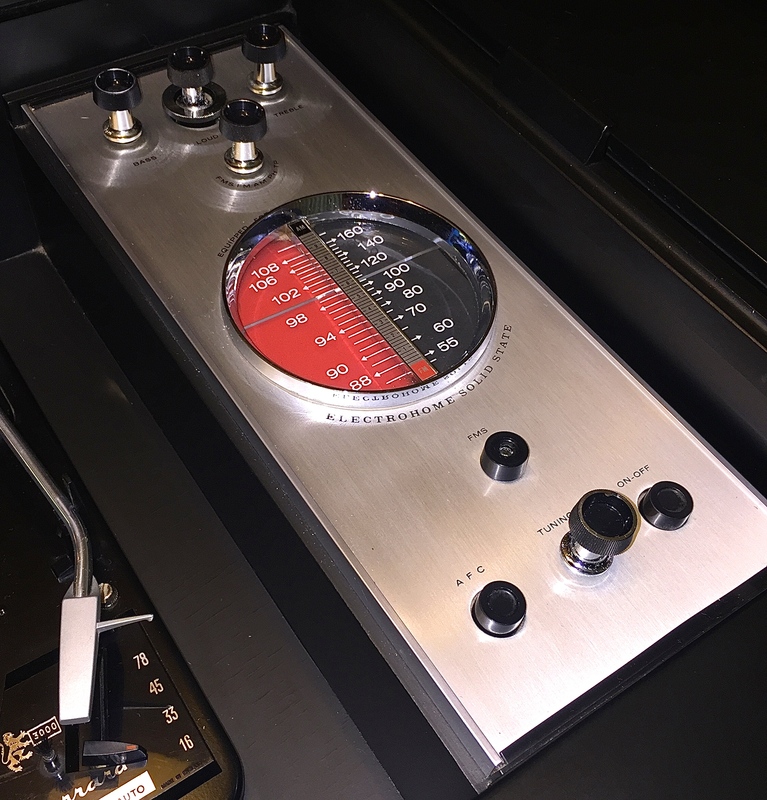 He went as far as to custom make switch mechanisms so the original knobs work and function with the new conversion. 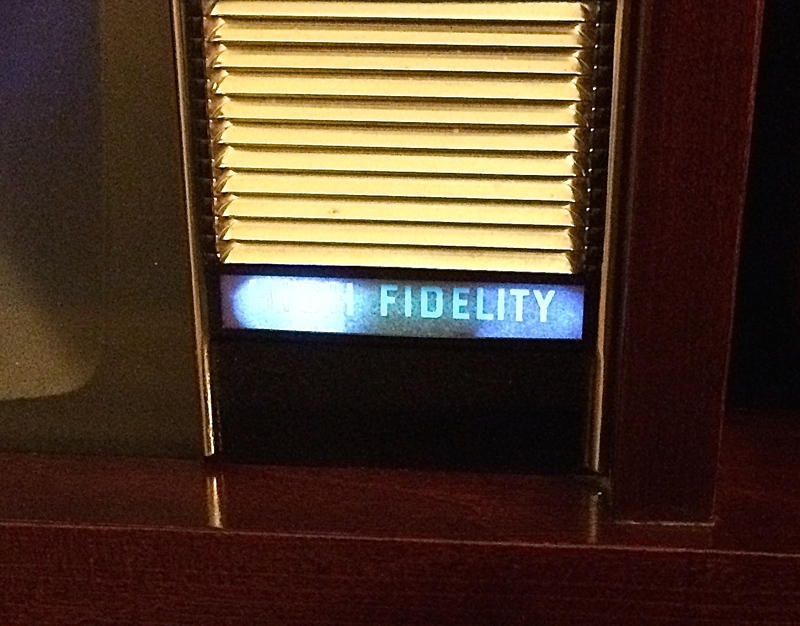 Justin was able to make the “Hi Fidelity” light function while the television is on. Without further ado here is the result of Justin’s efforts. And as with all Justin’s conversions it comes with a universal remote, not standard equipment in the 1950’s! Justin also installed the remote sensor in a way that it doesn’t take away from the appearance of the unit. 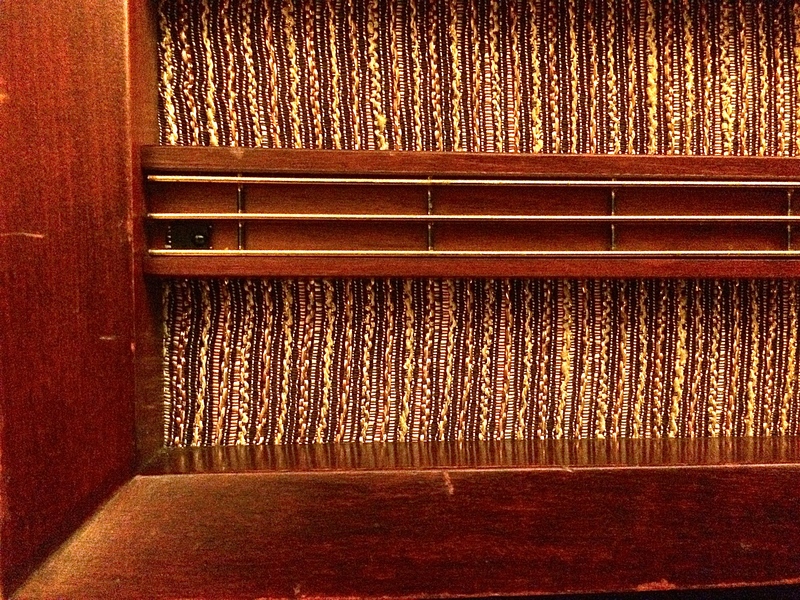 That little black rectangle is the sensor he installed in the grill of the Hi-Fi console. Another great piece to enjoy for years to come. Here is Justin going over what he did to make this gem more modern! 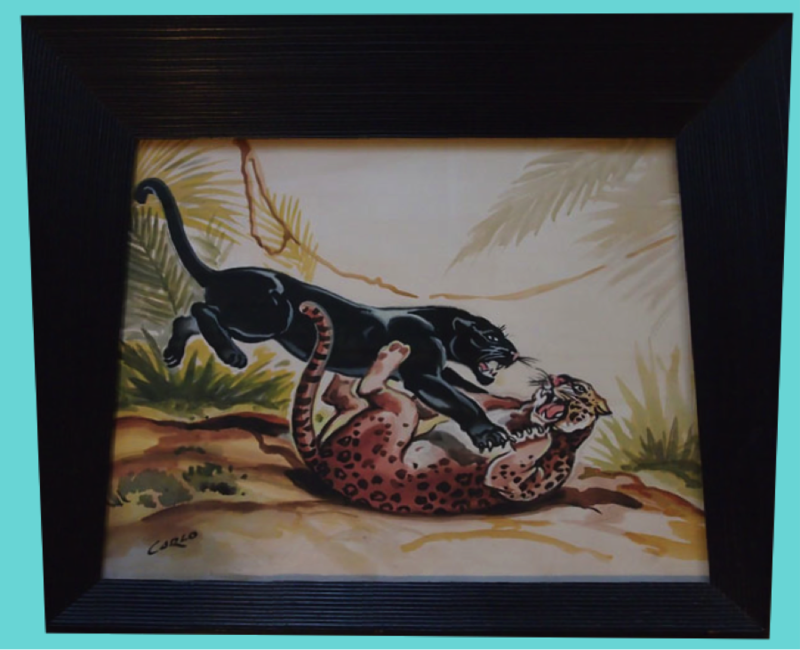 Posted in The Makin's Of Our Pad and tagged 1950's television, 1960's television, 50's television, 60's television, philco, predicta, rca, retro electronics, retro television, vintage electronics, vintage television. Bookmark the permalink. These models feature an opaque white plastic mask around the picture concealing a neon lamp. 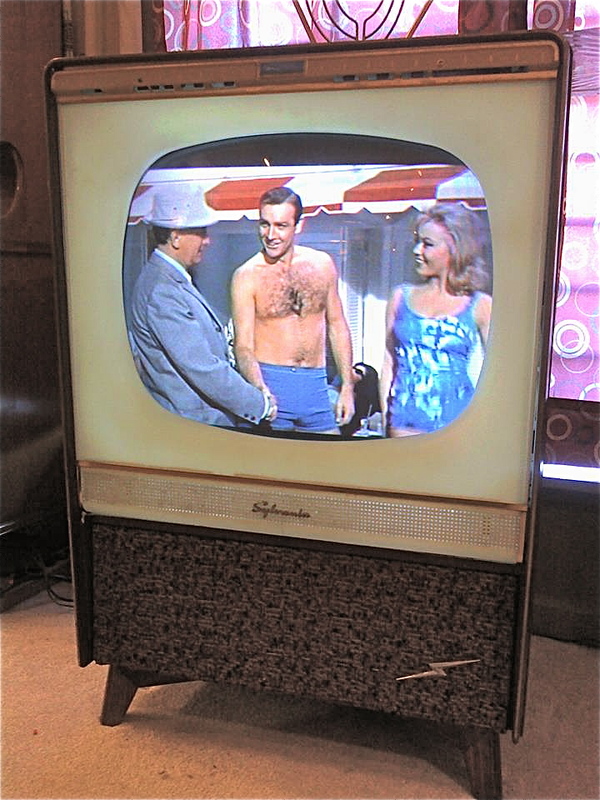 The gimmick was that you had a TV lamp built right into the screen! This is super rare and on display at Midway Antique Mall. Mel and I have had the good fortune to meet a guy by the name of Justin with Stellar Vintage Electronics. Justin is skilled in vintage electronics repair. 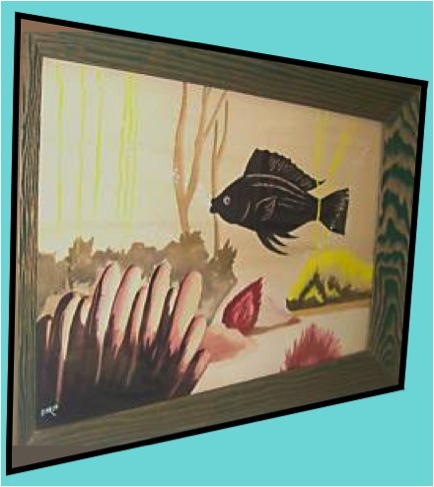 He has a shop inside Midway Antique Mall and is used by many dealers and customers at the mall. 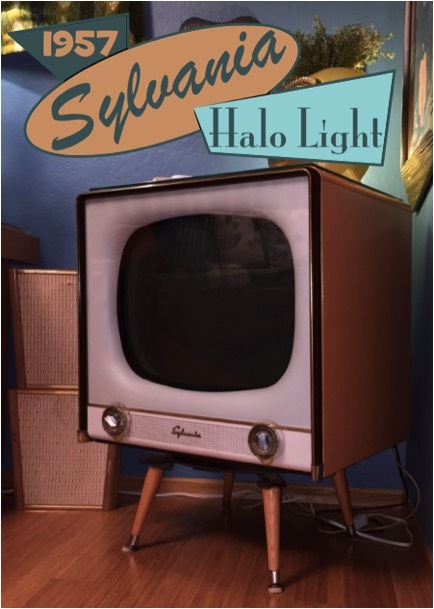 Recently, Mel and I became aware of a 1956 Sylvania Halolight television that Justin modified. 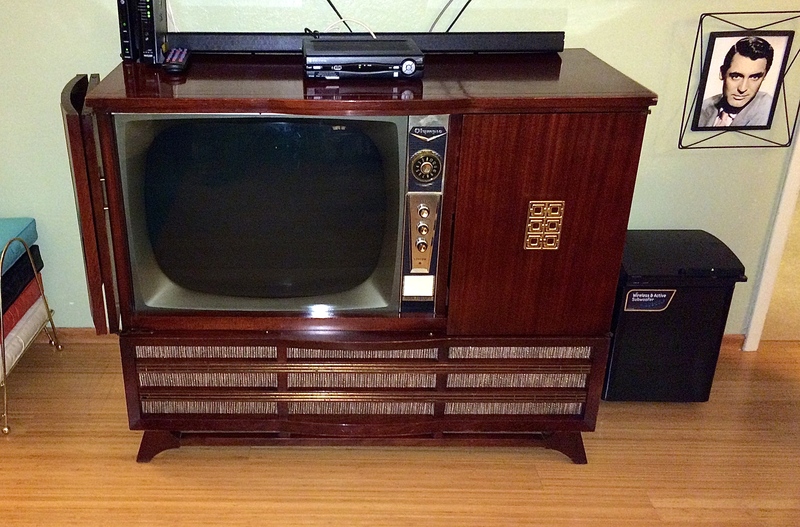 Justin specializes in modern color TV conversions into vintage TV cabinets and this is a great example. This television turned out fantastic. When we first saw this we were soo blown away by the picture and the fact that it works with a modern remote. Justin also makes sure that it has all the modern connectivity that current televisions have on the back. This is Justin’s next project. 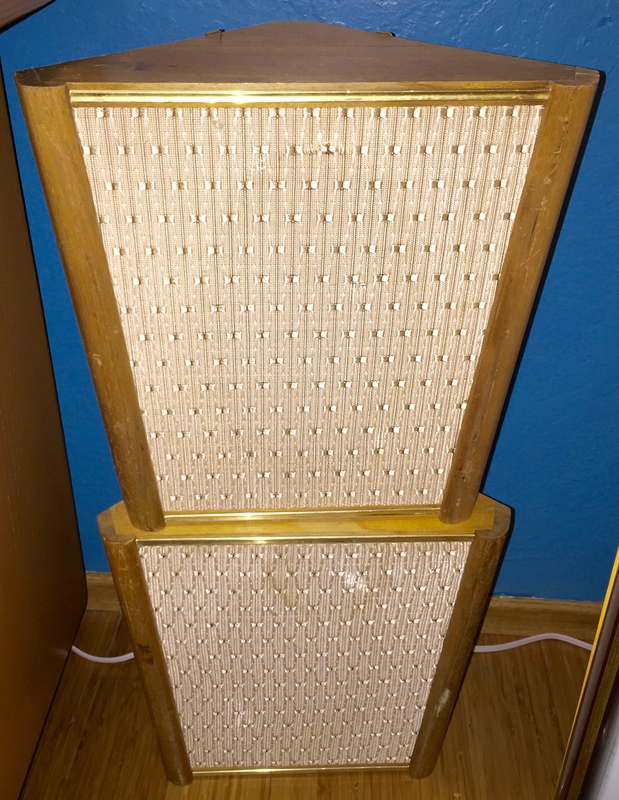 This is a 1958 Olympic Hi-Fi Combo. 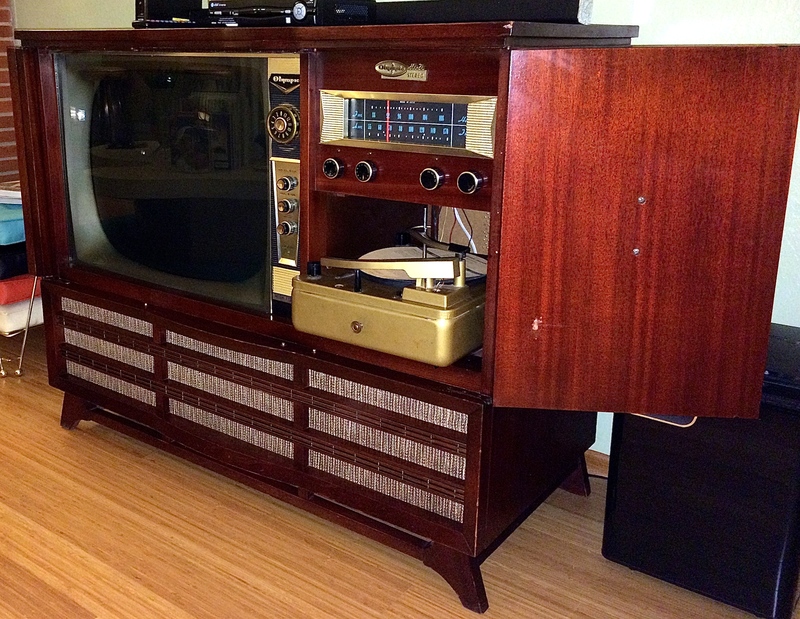 Justin is going to have this unit completely functional including the record player and radio. 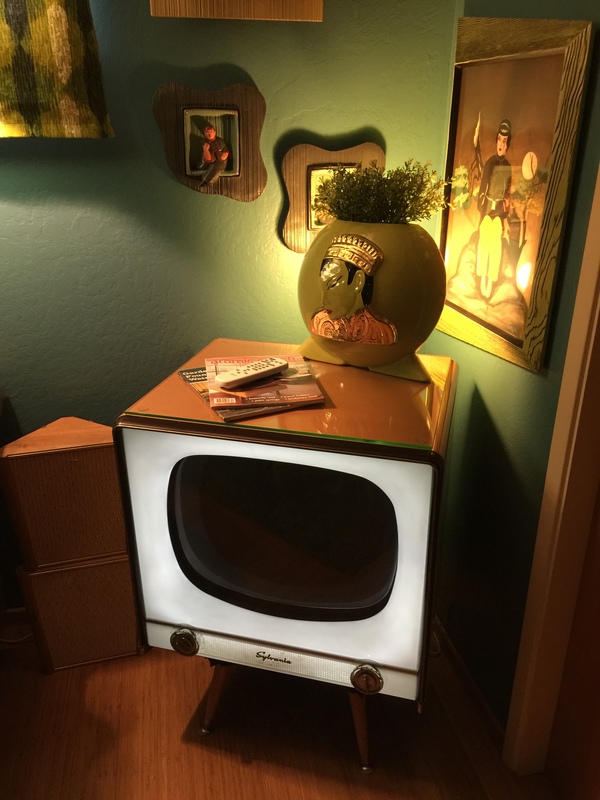 A neat thing Justin is doing with this television conversion is he plans to make the vintage controls work with the modern television conversion. 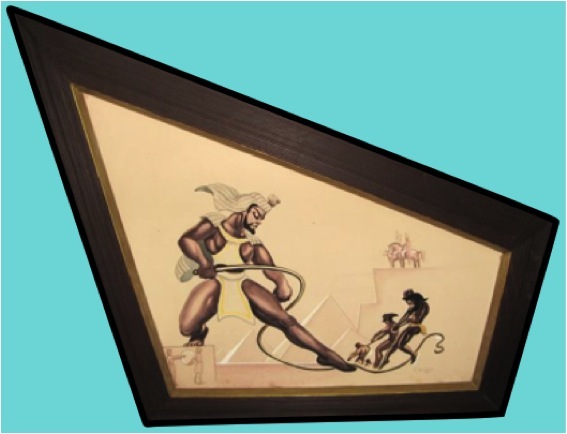 Justin’s conversions are seamless and we think his abilities will be valued in the antique world. 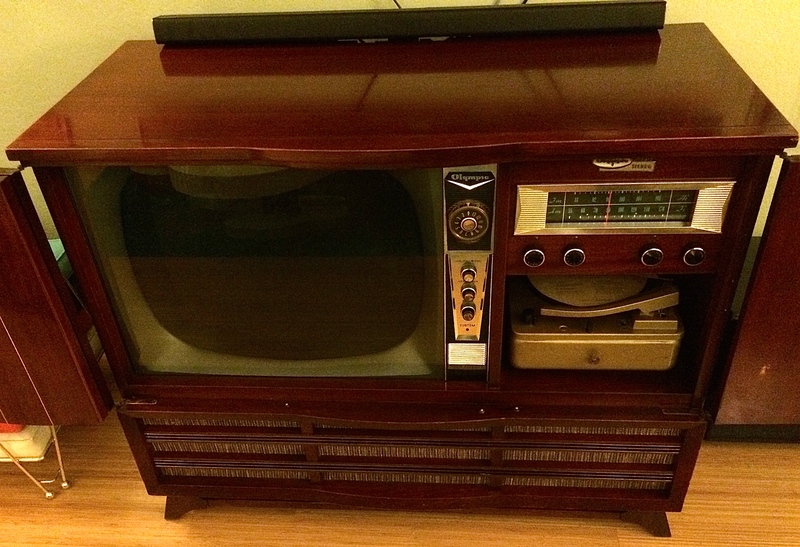 I have had many vintage televisions and had many of them repaired. 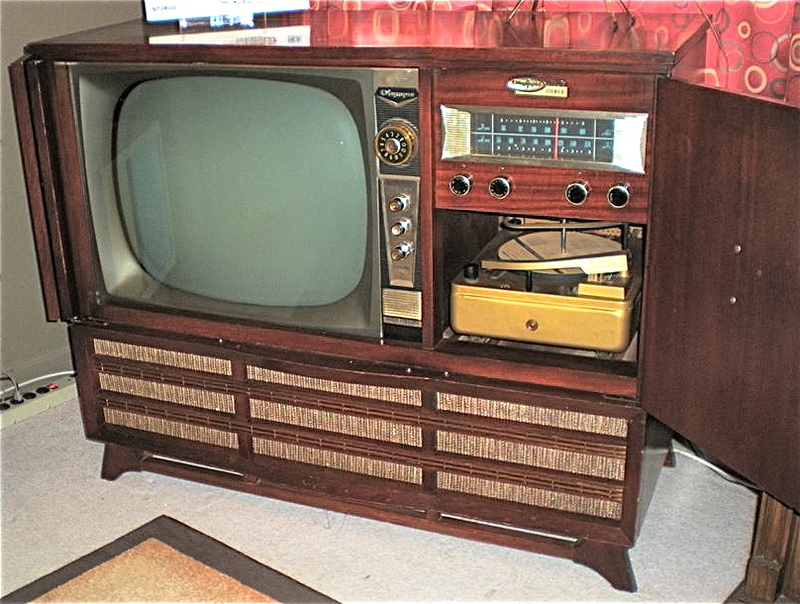 The bad thing is vintage televisions are prone to breaking down. 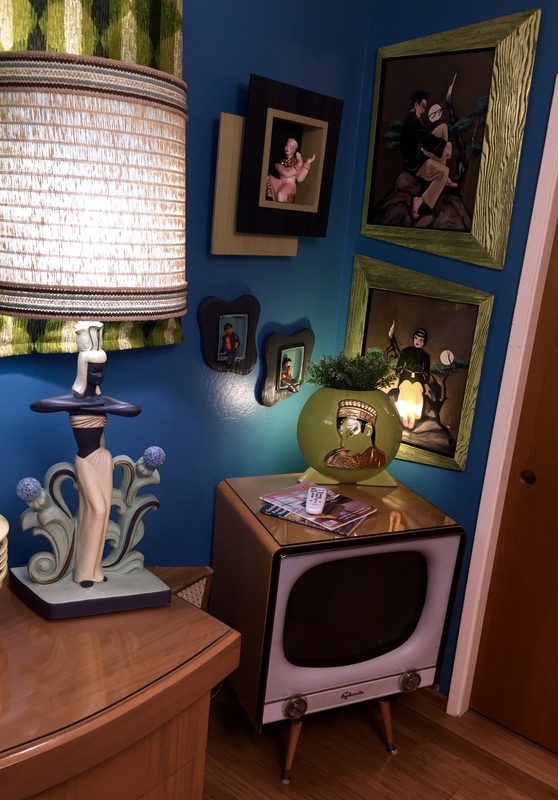 With what Justin does, it allows all of us mid century decor lovers to incorporate modern technology disguised in a vintage television cabinet. 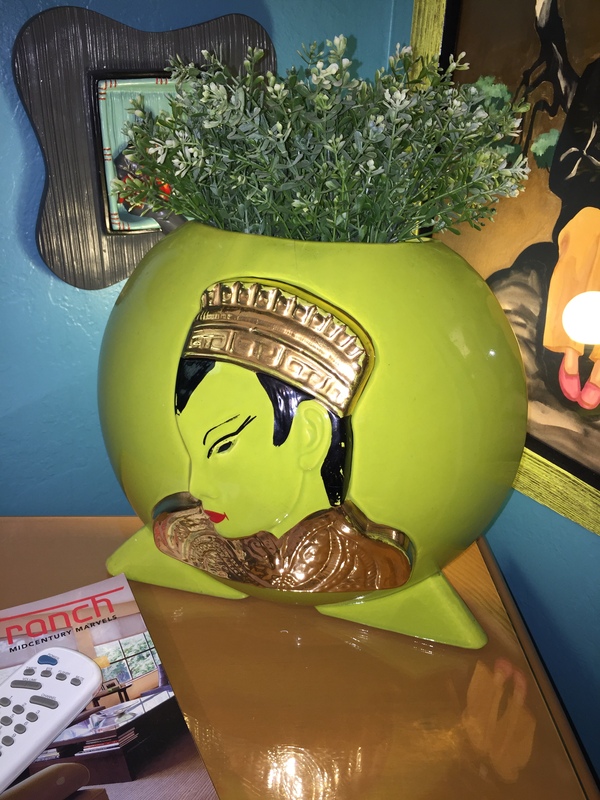 Justin just started a blog where he will showcase what he does so please support his efforts because he is not just a repair guy but in my opinion an artist keeping these pieces alive and in living rooms for years to come! 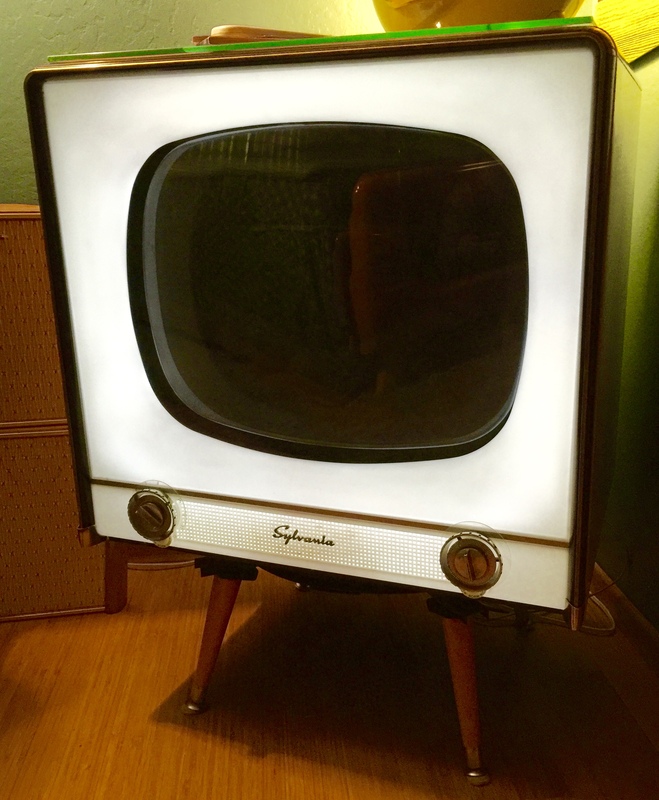 Posted in Other Stuff and tagged 1956 Sylvania Halo light television, 1956 Sylvania Halo light tv, 1956 Sylvania Halolight television, 1956 Sylvania Halolight tv, 1958 Olympic Hi-Fi Combo, 50's television, 50's television conversion, 50's television repair, 50's tv, 56 1956 Sylvania Halolight television, 56 Sylvania Halolight tv, atomic television, atomic television conversion, atomic television repair, atomic tv, atomic tv conversion, atomic tv repair, Halo light television, Halo light tv, Halolight television, Halolight tv, mcm sylvania tv, mcm television, mcm television conversion, mcm television repair, mcm tv, mcm tv conversion, mcm tv repair, mid century electronics, mid century sylvania tv, mid century television, mid century television conversion, mid century television repair, mid century tv, mid century tv conversion, mid century tv repair, retro electronics, retro sylvania tv, retro television, retro television conversion, retro tv, retro tv conversion, retro tv repair, vintage electronics, vintage Olympic television, vintage Olympic tv, vintage sylvania television, vintage sylvania tv, vintage television, vintage television conversion, vintage television repair, vintage televisions, vintage tv conversion, vintage tv repair. Bookmark the permalink. It even has the original makers tag! As normal, I was searching through Craigslist and came across this Telefunken 5094 WK for $50! I am a sucker for Telefunken, and this time it was no different. 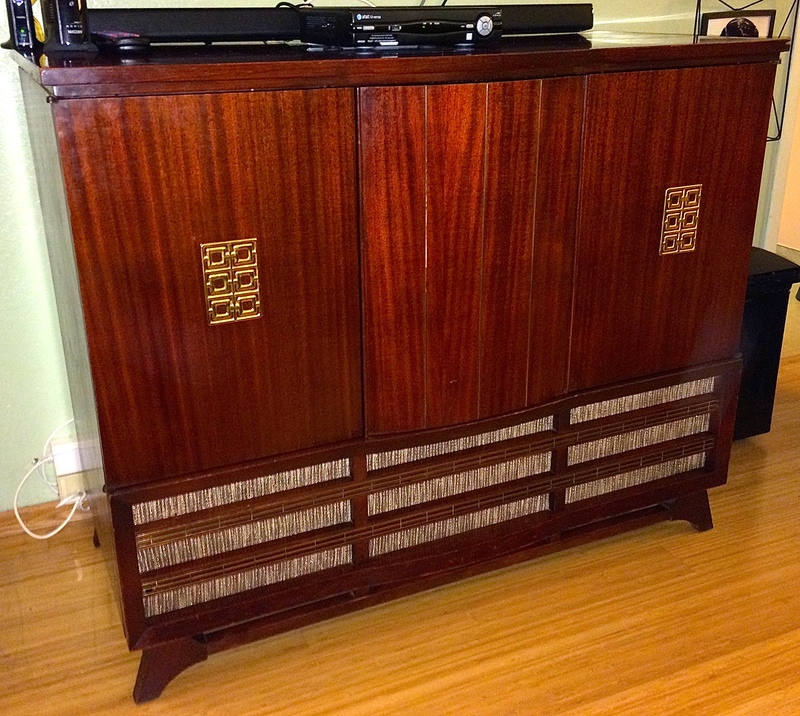 This unit is in pretty great shape for its age but needs a little reconditioning to put her back to normal. I love Telefunken and with my stereo repair guy Luis keeps telling me, “if I have to buy a German console, only buy Telefunken”. 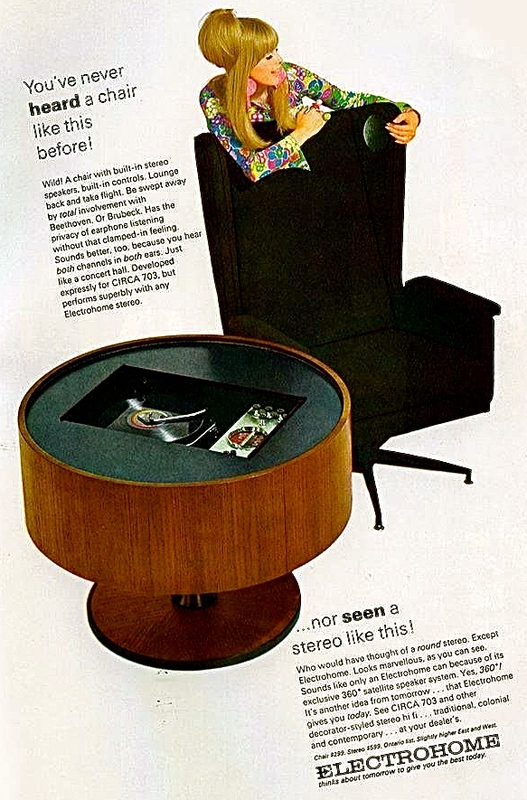 I do like the styling of Grundig units, but as Luis advised me, they are the lower end of German stereo units. Here she is in all her glory. All I have done to her at this point is oil her to darken the grain and rehydrate the wood. 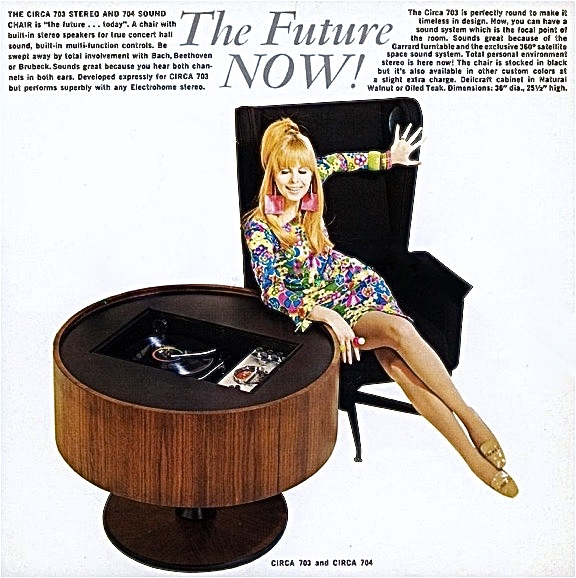 Those are furniture dollies under the legs of the Telefunken. It makes it easier to move around until I find a more permanent place for it. 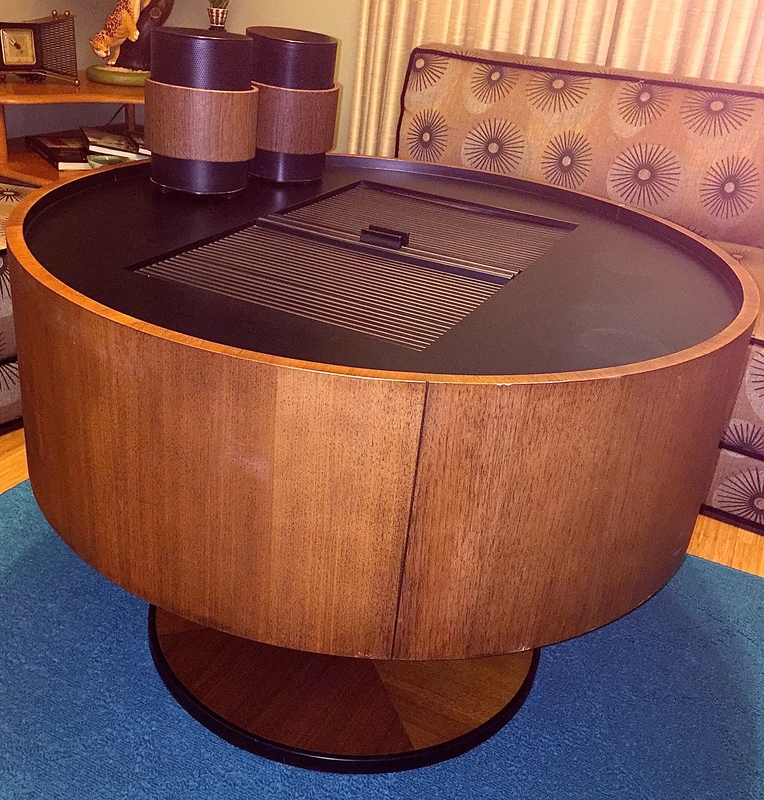 This unit has a fold out stereo and a lift up top for the record player. The cabinet is in remarkable shape for being 50+ years old. 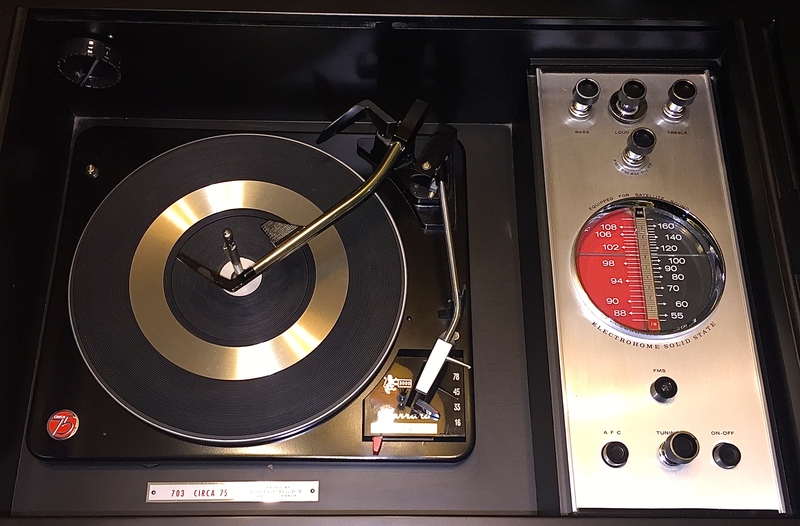 This unit has SW1, SW2, AM, FM and Phono. It also has the cats eye, which glows green when the channel is fully in tune. There is a compartment on the bottom that allows you to store records. Here is the original paper instruction label for the record player. This unit also has the dog ear speakers that pop out from the side to give a more complete sound. It has the original manual for the record player and the radio and they are in great shape! Way too cool! Original purchase paperwork. It looks like it was bought on December 5th 1961! Was this possibly a Christmas present? Plenty of connectivity as you can see. There is some wear on the top of this unit that I might do a quick restoration on to make it as good as new. 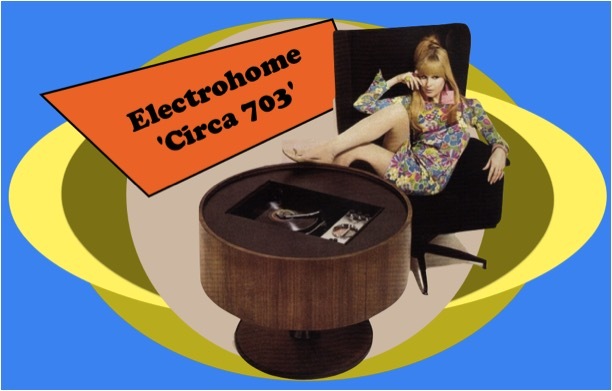 Posted in The Makin's Of Our Pad and tagged 1960's stereo, 60's stereo, audiophile, german audio, german electronics, german stereo, grundig, MCM hifi, MCM phonograph, MCM radio, MCM record player, MCM stero, mid century audio, Mid Century Console, mid century hifi, Mid Century Modern Console, mid century phonograph, mid century record player, mid century stereo, Mid century Stereo Consoles, Midcentury console, Midcentury electronics, midcentury hifi, Midcentury radio, Midcentury Stereo, Midcentury Stereo Console, Midcentury Stereo Consoles, retro audio, retro console, retro entertainment system, retro hifi, retro stereo, retro Stereo System, telefuken hifi, telefuken phonograph, telefuken radio, telefuken record player, telefuken stereo, vintage audio, vintage console, vintage electronics, Vintage entertainment System, vintage hifi, vintage phonograph, vintage record player, vintage stereo, Vintage Stereo System. Bookmark the permalink.